In case you’ve been living under a rock for the past 24 hours, Tiger Woods is on top of the golf world once again. The 42-year-old won the Tour Championship by two strokes on Sunday to capture his first title since 2013. This was his 80th career PGA Tour victory and third Tour Championship. Woods led the entire tournament and finished at 11-under. On the 18th Tiger smashed a 348-yard drive down the fairway and walked away smiling ear-to-ear. 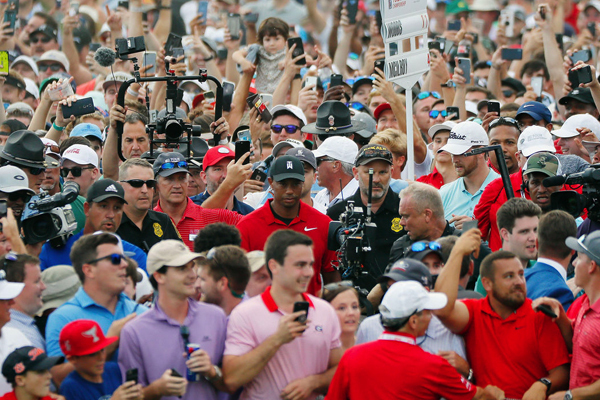 After his second shot, chaos ensued and hundreds of fans stormed the fairway to witness a tap-in par for the win. Twitter exploded after his win. You can’t help but be emotional watching this. Tiger has worked so hard, this is a special one. Congrats Tiger. Back at the top with the young guns, and where you belong……. with all the GOATS! A Tip of the Cap to you. Have a cold one with friends and family. Woods is now No. 13 in the world rankings, all the way up from 656th where he sat at the end of 2017.